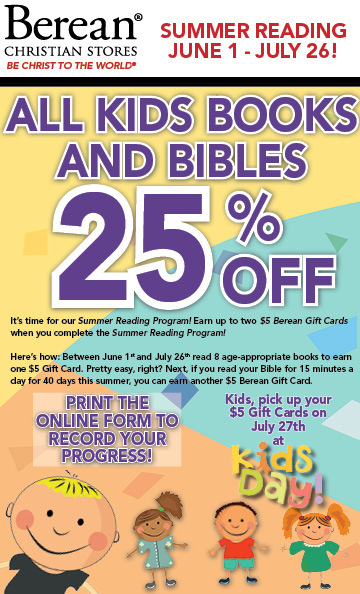 "Summer Reading is June 1 - July 26, all kid's books and Bibles 25% OFF. It's time for our Summer Reading Program! Earn up to two $5 Berean Gift Cards when you complete the Summer Reading Program! Here's how: Between June 1st and July 26th read 8 age-appropriate books to earn one $5 Gift Card. Pretty easy, right? Next, if you read your Bible for 15 minutes a day for 40 days this summer, you can earn another $5 Berean Gift Card. Kids, pick up your $5 Gift Cards on July 27th at KIDS DAY! Print the ONLINE FORM to record your progress!"